Break-Fix Services – As businesses of all sizes attempt to make due with aging computer systems, we find that the demand for our break-fix services is constantly increasing. Dan Tech's trained and knowledgeable technicians are dispatched to your location to diagnose and resolve computer hardware problems. We troubleshoot the issue, order any parts needed, and restore the system to working condition quickly and at the lowest cost possible. 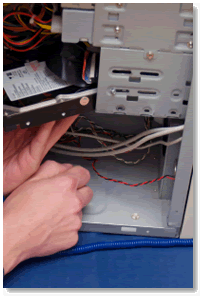 Installation and Moves - Adding new computer equipment, or relocating existing equipment, is hassle-free with service from Dan Tech. Our qualified technicians are available to install new systems, or to advise and assist with the relocation of existing equipment. If you are moving to a new physical location, we can take full responsibility for the removal, transportation, and reinstallation of computer hardware at your new location. Updates, and Upgrades – Existing software and firmware needs to be kept up to date with the latest security releases and features. And adding new software applications can be tricky, sometimes impacting existing applications. Let Dan Tech take the lead for you, dispatching our skilled technicians to install software or hardware updates and upgrades. Desk Side Support – Dan Tech provides on the spot personal assistance to resolve an end user's software or networking problem. One to one coaching and training helps improve the user's productivity within software applications, improving processes and reducing downtime. Common help points include data migration, security, and applications. Depot Repair – You may not always need on-site services, in some cases it makes more sense to use one of our service locations to repair the unit or device. Repairs to your equipment will be completed quickly to minimize downtimes. Consulting – With over 10 years experience designing and implementing technology solutions, Dan Tech can provide clients with the knowledge and expertise needed to implement server systems and workplace IT solutions that make staff more productive.